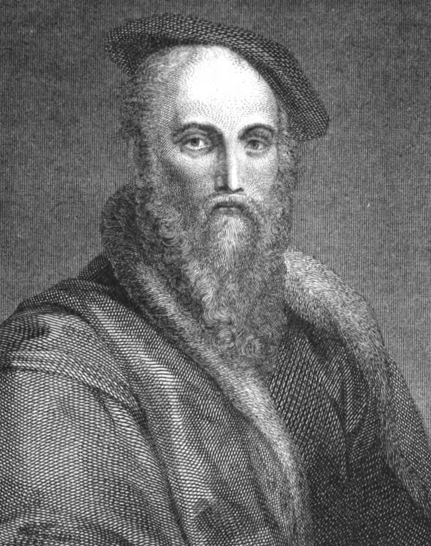 Sir Thomas Wyatt by J.Thurston, engraved by W.H Worthinton after a drawing by Hans Holbein in the Buckingham Library from Charles Cowden Clarke, The Poetical Works of Sir Thomas Wyatt (Edinburgh: William P. Nimmo: 1868). Courtiers played a dangerous game at Henry VIII’s court. The King himself was ruthlessly amoral and did not fret excessively over using brute force (including executions) to drag the country through radical changes. (His daughters would also find the executioner to be a useful political ally.) Over time he became dangerously unstable, and neither evidence nor a legal justification was necessary to result in beheadings. Courtiers, the class whose fortunes ebbed or waned at the bidding of the sovereign, themselves of course trimmed their consciences accordingly; in fact they tailored their politics to fit the times. There was no such thing as policy disagreement—only treason. With every hanger-on a potential accuser or informant, and the King becoming more suspicious and more capricious with each passing year, the life of every ambitious person (so much less his office) was never secure. It was a strange garden for the first flowering of English letters. But the King was in many senses a Renaissance man, and at the beginning cultivated the best and most enlightened minds of the aristocracy. When Thomas Wyatt (1503-1542) came up to Court as his father’s clerk in 1524, he was eminently qualified to attract attention and had the personality and good will necessary to withstand considerable buffeting, which he would receive in due course. Thomas Wyatt’s father, Sir Henry Wyatt, gained his station from a decision he made in his early 20s: to throw in his lot with Henry Tudor in the effort to depose Richard III. It is not known why Henry Wyatt made this decision (or indeed much about Henry Wyatt before he did so), but the decision would have consequences. According to this family (especially his son Thomas), Henry was imprisoned and tortured. Legend had it that Richard himself offered Henry Wyatt the chance to forsake Henry Tudor and join him, but Henry (politely, of course) refused. And so Richard watched him receive the rack and something like waterboarding (only with vinegar and mustard). When Henry Tudor became Henry VII, he did not forget Henry Wyatt’s loyalty. (Henry Wyatt undoubtedly fought for Henry Tudor, even if the Tower of London story is a myth.) Wyatt, who carried out diplomatic engagements for the King, would become a member of the Privy Council and later one of the executors of Henry VII’s will. 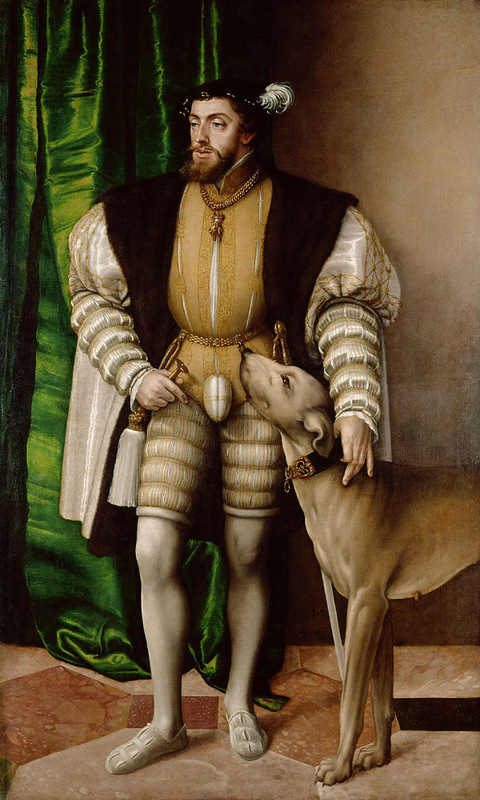 After the King’s death, Wyatt was one of the managers of public affairs while Henry VIII remained a minor. After the coronation Henry Wyatt was made Knight of the Bath and entered Henry VIII’s Privy Council. Other titles followed Wyatt’s valor at the Battle of the Spurs. He also became a close associate and friend of Thomas Boleyn, the father of the woman who caused Henry to break with Rome. In 1512, for example, he was appointed joint constable of Norwich Castle with Sir Thomas. (For a while the connection with the Boleyns enhanced one’s connection with the Crown.) In short, Henry Wyatt’s unwavering loyalty to the Tudors was repeatedly rewarded by two kings, and that good will was bound to pass to Henry’s son, Thomas Wyatt. Wyatt the younger also had ample attributes to make him attractive to Henry. Foremost, he was actually learned; he was not simply the dilettante that most courtiers were. He graduated from St. John’s at Cambridge (B.A. 1518; M.A. 1520), (possibly) having studied also at Oxford. He spoke four languages (and, as any university graduate, was familiar with the classics). His fawning eighteenth century admirer Clarke says he sang and played the lute, but gives no source for the statement. Wyatt wrote trenchant prose; his diplomatic correspondence to the King “pleased marvellously well,” according to Thomas Wriothesley, one of the Henry’s principal Secretaries. He helped modernize English poetry and introduced the sonnet from Italy. He was tall, well-built and handsome. He dabbled in the martial spirit of the courtier. He may have spent time in the army. If not, he somehow otherwise acquired the skills to become one of the 16 participants in the King’s stylized jousting, “mazy dances” and feats-of-arms tournament at Greenwich right after Christmas in 1525. A successful mission led to another (in 1527 to the Papal Court with Sir John Russell and then Venice alone after Russell broke his leg). It was during this visit that he supposedly eluded or escaped from the Spanish troops of Emperor Charles V. In 1529-32 he occupied the post of high marshal of a small command, then marshal of the town of Calais. In 1533 he was admitted to the Privy Council, and performed the service (in place of his father) of Royal Ewerer at the coronation of Anne Boleyn (and poured scented water on her hands). It was undoubtedly before this time that Wyatt had attracted the attention of Thomas Cromwell, the highly adept politician and chief adviser to Henry, who was the force who cleared away all obstacles to the marriage between Anne and Henry. Cromwell would become Thomas Wyatt’s mentor, ensuring his expenses were paid on foreign missions, watching over his affairs at home, and offering fatherly advice about his deranged finances and chiding him for his overly generous inclination to lend money. But Wyatt needed his skills the most when Anne Boleyn fell. Her arrest, together with her five alleged paramours (including her brother) showed that this time Henry was not going to rely on legalisms or pleadings to end a marriage. The strike came so suddenly and the fear was so general that even Anne’s father acquiesced, not lifting a finger in defense of his children. It would not have helped, of course, and he might have died in the process. But what are fathers to do in defense of their children? He did nothing and was ruined anyway. Thomas Cromwell took his office as Lord Privy Seal. 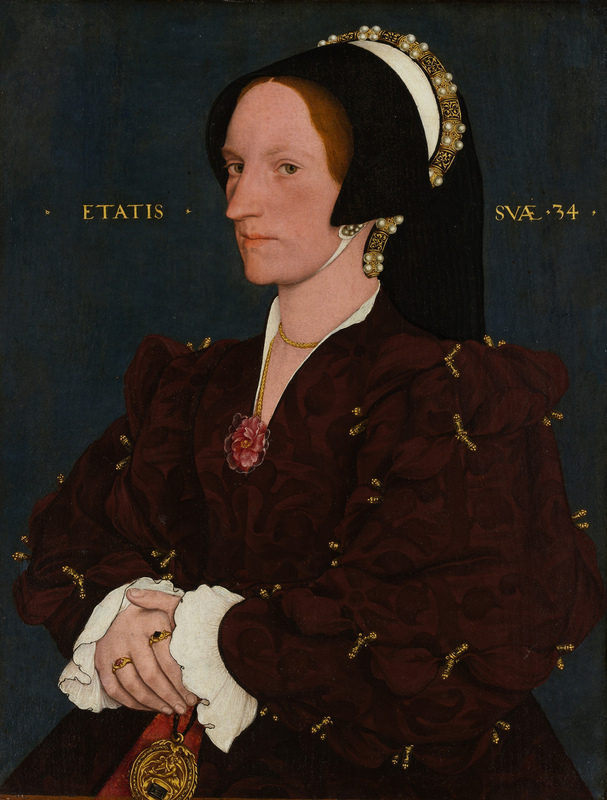 Portrait of Margaret Wyatt, Lady Lee by Workshop of Hans Holbein the Younger. (Oil on panel. Early 1540s. Metropolitan Museum of Art.) Click to enlarge. Because of the families’ connection, Thomas Wyatt also came under suspicion. The two families lived near each other, and Thomas knew Anne since they were children. His older sister Margaret (later Lady Margaret Lee) became one of the Queen’s ladies-in-waiting. She was so close to Anne that she attended to her on the scaffold, for which Anne gave her a gilt prayer-book. Margaret would lead the small group of mourners after her death. Thomas also came in contact with Anne when she made an excursion to Calais in 1532 and back at Court when Anne was attendant to Queen Catherine. His connection left Wyatt’s opponents with an opening, and there were rumors that he would be arrested. And in fact he was, but evidently not for suspicions relating to Anne; rather for assaulting Henry Brandon, Duke of Suffolk, a particular favorite of Henry VIII. Wyatt the previous year had gotten into an affray with the sergeants in London , and a sergeant died in the affair. Watt was said to have been sent to Fleet Prison for that brawl. It therefore probably took some maneuvering for Cromwell get him out of this second scrape. But after a month in prison, Wyatt was released to “amend his conduct” in the custody of his father. Sir Thomas Wyatt, the elder, understanding that the King minded to marry her, came to him and said, Sir I pray your grace pardon me, both of my offence and my boldness. I am come to your grace of myself to discover and utter my own shame but yet my most bounden duty and loyalty that I owe to your grace, and the careful tendering of your honor more than of m own honesty forceth me to do this. Sir, I am credibly informed that your grace intendeth to take to your wife the Lady Anne Bulleyn, wherein I beseech your grace to be well advised what you do, for she is not meet to be copled with your grace, her conversation hath been so loose and base which thing I know not so much by hear-say as by my own experience as one that have had my carnal pleasure with her. At the hearing of this, the King for a while being something astonyed, said to him,—Wyatt, thou hast done like an honest men, yet I charge thee to make no more words of this matter to any living man. On the basis of allegations from the coarse mind of the religious polemicist, Wyatt’s poetry has been scoured to find traces of the supposed relation between Boleyn and Wyatt. A few poetic scraps have been heaped up to convince some literary historians of the relationship. And now the mutual attraction is given out as certain fact in the popular literature surrounding Anne Boleyn. There remains no historical evidence for the supposition, however. Wyatt’s position did not ultimately depend on public approval or even close attention from the King. Wyatt’s security rested on Thomas Cromwell, who had been sure-footed in treacherous terrain so far. Cromwell now selected Wyatt for his most important and difficult diplomatic mission. Wyatt was charged with the near impossible task of forging an alliance between Henry and Emperor Charles V, who, as nephew of Catherine of Aragon, was not personally predisposed towards the King. The mission required Wyatt to remain in Spain, which could not have pleased him. Spain of course was not Italy as would be painfully clear to a man attached to literature and music. It was the most reactionary country in Europe, where the Inquisition prowled everywhere and was almost as powerful as the Emperor. And Charles was implacable against Henry. Part of Wyatt’s unhappiness in Spain must have been due to the observation that the French, fighting the forces of Charles in Italy, were the natural allies of England, not the Emperor. This was the policy promoted by Queen Anne, and it was a factor in her downfall. Wyatt was either too loyal or too prudent to involve himself in grand strategy. To make matters worse, the King thought the mission important enough to send two envoys to assist, Simon Heynes and Edmund Bonner. Each had entirely separate reasons for seeking to break Wyatt—Heynes was supremely ambitious; Bonner was secretly devoted to Rome—and they had a common reason: they were both offended by the cavalier treatment they received from Wyatt. They reported many things but their crucial allegations were that Wyatt spoke disrespectfully of the King and conspired traitorously with Reginald Pole, who had denied the legality of the annulment of the Catherine marriage and called on the crowned prices to depose Henry. (Bonner would later join with Pole in burning Protestants in the days of Mary I.) What he learned of the allegations must have rankled a man with a temper as explosive as Wyatt’s, but he remained in Spain discharging his office for two years. When he returned he demanded a thorough investigation into all the charges made against him. Cromwell waived them off as insignificant. He likely prevented the charges from reaching anyone capable of commencing a prosecution. Wyatt for his part went home and spent several months in Kent before he was sent on yet another important assignment, again to Charles V.
This time, however, alliance with the Emperor was not the goal. Policy in London had changed by necessity: the Truce of Nice ended the Italian War between Charles and Francis I, so the Emperor had no real need for Henry now. The new strategy was to align with Germany. To that end Cromwell pushed Henry to fulfill his promise to marry Anne of Cleves despite Henry’s strong disinclination once he met her. So Wyatt’s mission to Charles was not so much to liaise with him but rather to shadow him. Wyatt was sent to France to join up with him and, when possible, frustrate any move contrary to Henry’s interests. 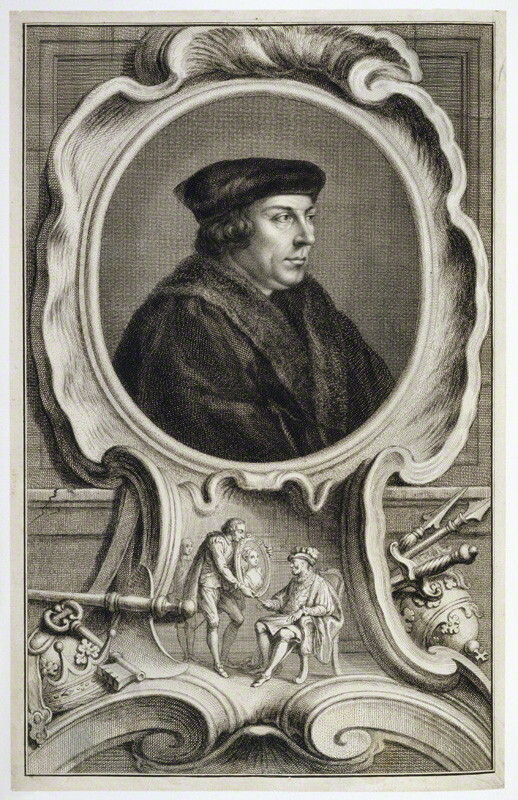 Thomas Cromwell by Jacobus Houbraken, published by John & Paul Knapton, after Hans Holbein the Younger, line engraving, published 1739. (Used with the permission of the National Portrait Gallery, London.) Click to enlarge. Charles was on the move toward Belgium. Wyatt met him at Chateaureault and followed him to Paris, Brussels and then Ghent. He wrote vivid and insightful dispatches back to the court, seemed to enjoy the game of international diplomatic stratagems, acted rejuvenated for a while, but then got tired of the whole thing. He requested to be summoned home. When he returned in May 1540 he discovered the disaster: Cromwell was about to fall. The marriage to Anne of Cleves proved immediately intolerable to Henry. And Cromwell would bear the full weight of that blunder. Wyatt retired to Kent, and Cromwell was arrested on June 10. A bill of attainder was passed on June 29. And Cromwell was executed on July 28, 1540. Wyatt no longer had a protector at Court. And Bonner was now Bishop of London, and Heynes, after signing the decree annulling Henry’s marriage to Anne of Cleves, would become one of the first prebendaries of Westminster. It was only a matter of time before the old charges would surface. Wyatt was arrested in the beginning of 1541 and sent to the Tower. The Privy Council demanded that he respond in writing and list every contact or correspondence he had with any treasonous person. Wyatt responded indignantly (but fully). At his trial there was no evidence that he directly had any dealing with Pool. In the statement he made in his own defense after trial (persons accused of treason were not then entitled to counsel) he admitted that while in Spain he sent Mason to meet Pool, but vigorously asserted it was solely to obtain intelligence of his intentions. He also stated that Mason’s mission was not only the kind of thing often engaged in by ambassadors but it was also agreed to specifically in this case by both Heynes and Bonner themselves (who failed to testify). The jury acquitted Wyatt. Freed, Wyatt retired to his castle in Kent and wrote his satires (in terzas rimas) and his penitential psalms. In Tudor England, however, what did not get you beheaded was no longer something that concerned Henry. In the fall of 1542 he was ordered to travel to Falmouth to meet a delegation from Charles V in connection with a war on France that the Emperor and the King were considering. On his way there, he contracted a fever and died in Sherborne on October 10-11, 1542. He was 39. 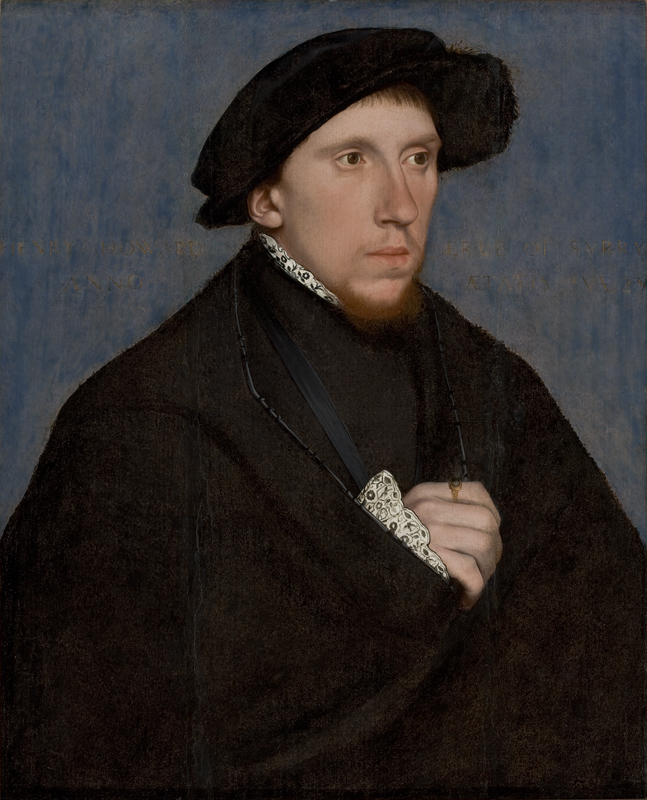 Henry Howard, Earl of Surrey by Hans Holbein. (Oil on wood. c1542. São Paulo Museum of Art.) Click to enlarge. 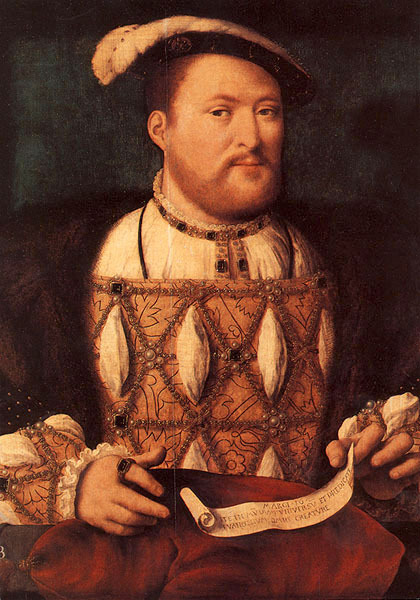 Capricious egoist that he was, Henry VIII nevertheless sparked a rebirth of the arts in England by his interest in music, painting and poetry and by encouraging his courtiers by his example and by gifts of office. Wyatt along with another courtier, the Earl of Surrey, were the first serious poets since Chaucer. But since Chaucer wrote more than a century and a half before and indeed in a different dialect, Wyatt and Surrey might justly be called the fathers of modern English poetry. The lives and tastes of these two poets were remarkably similar, although Wyatt was about 15 years older than Surrey. (Surrey in fact was only a few years older than Wyatt’s own son.) They were both well-educated, which meant, above all, they knew Latin (and some Greek) authors. They both were fluent in multiple languages, and both admired the literature of Italy. They both employed versions of the Italian sonnet, after Petrarch, with Wyatt receiving principal credit for its introduction. Wyatt also used the terza rima form invented by Dante. Their personalities seemed similar, and their careers ran in a parallel course. 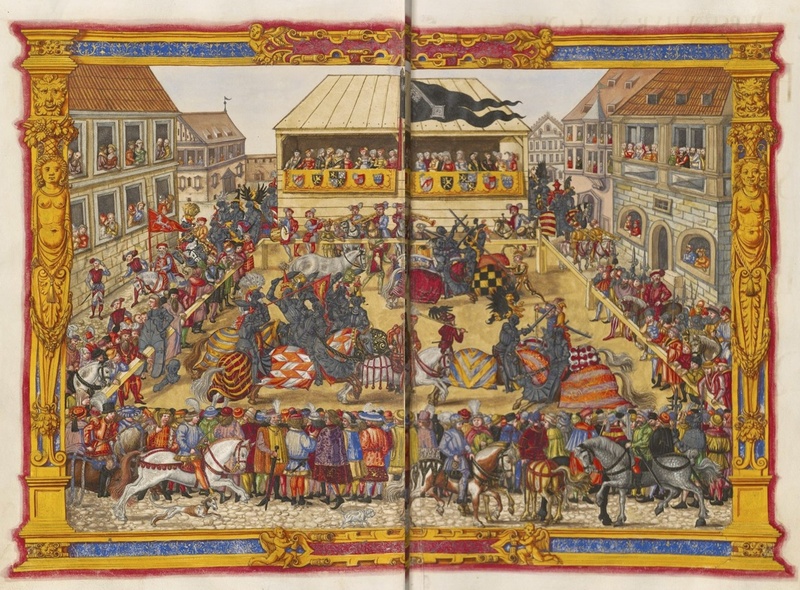 Both participated in royal jousting tournaments. Both at one time commanded a garrison of troops. Both were imprisoned for violent assaults. Both were connected to the Boleyn family. (Surrey was Anne Boleyn’s cousin.) While Wyatt’s father was the Royal Ewerer and Thomas Wyatt performed that office during Anne Boleyn’s coronation, Surrey carried the sword before the King in that ceremony and would later act as cup-bearer for the King. Surrey’s family outranked Wyatt’s in social eminence, but Surrey admired Wyatt all the same. It was Surrey who described Wyatt’s appearance as one in which “force and beauty met.” Surrey had closer family and personal connections with the King. (He was the playmate of the King’s son, Henry FitzRoy, at the request of the King to Surrey’s father in 1529, and Anne Boleyn once suggested Surrey marry the King’s daughter Mary.) But in the end that did not save him. 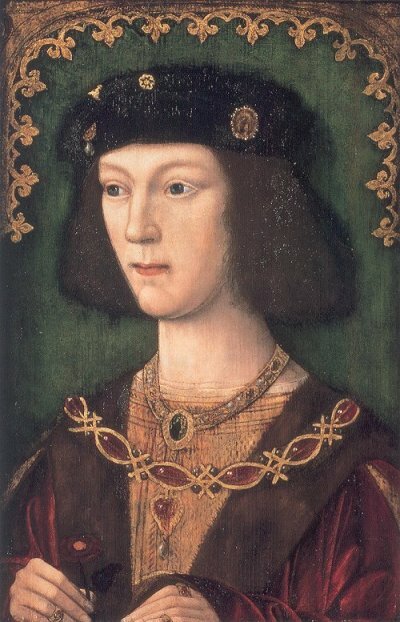 Surrey was beheaded at the end of Henry’s reign. It is tempting to think that Wyatt was more cautious or politic than Surrey, but the fact is simply that Wyatt died before the increasingly random blows of the violently unstable Henry would inevitably touch him. Of man’s first disobedience, and the fruit …. But Tottel of course never read Milton, and if he published him, who knows?, he might have changed Milton’s line as well. The third line has an extra syllable after the first anapest (making the first foot technically a tertius paeon). If you go through the stanzas with a pencil you can note unusual substitutions for the standard iamb, which takes hold beginning in the second stanza. Of course, strict adherence to a repeated metrical pattern tends to make the verse sound sing-sing. And poets ought to change rhythm for effect or for meaning. The preferred result is when the meter is natural enough to hide the underlying rhythm and that rhythm itself is not awkward (either by being too strict or too clumsy). You can decide if Wyatt’s metrical changes are justified by the effect they achieve. For myself, I find that at least some of the unexpected feet are simply forced. It would be easy to see the poem as a lyric to a song (perhaps one composed by Wyatt) with the extra unaccented syllables “swallowed” as is often the case in folk or popular music. That conclusion is undercut by the reference in line 29 to the readers of the poem, rather than listeners. Whatever problems Wyatt has with strict prosody, he maintains a uniform number of stressed syllables in each line of a particular poem. And that itself was a step up from the chaotic versifiers who came before him. In the next post on Wyatt I’ll give more thoughts on the technical qualities of Wyatt’s poems, but here let’s just look at another aspect of today’s poem—a poem that has some autobiographical significance. While it’s not possible to date Wyatt’s poetry with precision (and most can’t even be guessed at), the poem below likely was written after his last imprisonment: the line “be I bond or be I free” suggests a recent acquaintance with incarceration. The tone also suggests poise in the face of false accusation (the same tone as his closing statement at the trial). Regardless of the circumstances that led to the creation, the poem has a Renaissance viewpoint. The narrator asserts his right to his personhood regardless what others think. Even in despotic Tudor England, a man (at least an aristocratic man) has a right to his personality that a Medieval man would never claim. And the pose he strikes, fundamentally Stoic, comes straight from Seneca. Seek not I pray thee, my Son, that Honesty which appeareth, and is not indeed. Be well assured it is no common thing, nor no common man’s judgment to judge well of Honesty; nor it is no common thing to come by; but so much it is the more goodly, for that it is so rare and strange. The coming to this point that I would so fain have you have, is to consider a man’s own self what he is, and wherefore he is; and herein let him think verily that so goodly a work as man is, for whom all other things were wrought, was not wrought but for goodly things. Yet I am as I am, be it pleasure or pain. For I am as I am whosoever say nay. Line 11: Tillyrand tries to make “mean” into “meaning” and distorts the thought. Wyatt is saying that he is taking the middle ground (the “mean”) between mirth and sadness, since other people dissemble. Gerald Bullett, Silver Poets of the Sixteenth Century (London: J.M. Dent & Co; 1947). Charles Cowden Clarke (ed. ), The Poetical Works of Sir Thomas Wyatt with Memoir and Critical Dissertation (Edinburgh: William P. Nimmo: 1868). John W. Cunliffe, The Influence of Seneca on Elizabethan Tragedy (London: Macmillan & Co: 1893). A.K. Foxwell, A Study of Sir Thomas Wyatt’s Poems (London: University of London Press: 1911). Gordon Goodwin, “Simon Heynes,” Dictionary of National Biography (London: Smith, Elder & Co: 1886-1900), vol. 26, p. 325. Nicholas Harpsfield, A treatise on the pretended divorce between Henry VIII and Catharine of Aragon, ed. Nicholas Pocock (London: For the Camden Society: 1878). Sidney Lee, “Henry Howard,” Dictionary of National Biography (London: Smith, Elder & Co: 1886-1900), vol. 24, pp. 24-28. Henry Morley, A First Sketch of English Literature (London: Cassell & Co: 1912). Geo[rge] Fred[erick] Nott, The Works of Henry Howard, Earl of Surrey, and of Sir Thomas Wyatt, the Elder (London: Longman, Hurst, Rees, Orme, and Brown: 1815-16) (2 volumes). E.M. Spearing, The Elizabethan Translations of Seneca’s Tragedies (Cambridge: W. Heffer & Sons Ltd: 1912). Richard Tottel, Tottel’s Miscellany. Songes and Sonnettes: first and second editions  collated by Edward Arber (London: n.p. : 1870). E.M.W. Tillyrand, The Poetry of Sir Thomas Wyatt: A Selection and a Study (London: The Scholartis Press: 1929). Thomas Wyatt, The Poetical Works of Sir Thomas Wyatt [with Memoir by Sir Harris Nicolas] (London: The Aldine edition of the British poets by C. Whittingham: 1831). Thanks for the glimpse into the annals of literary history. Fascinating insight into the Tudor court, and I was delighted to read the lyrics ‘I am as I am’, ( I can see David Mitchell doing a brilliant sketch on that!!) As a diplomat of some standing, it has a certain irony within it. I have been reading Hilary Mantel’s wonderful novels about the era – she has an attention to detail that is supported by a clear observation of human nature and a writing style that demands you to continue reading. I love what she said in interview – that history is not in the past, it is a part of who we are now. Have you tried her novels?